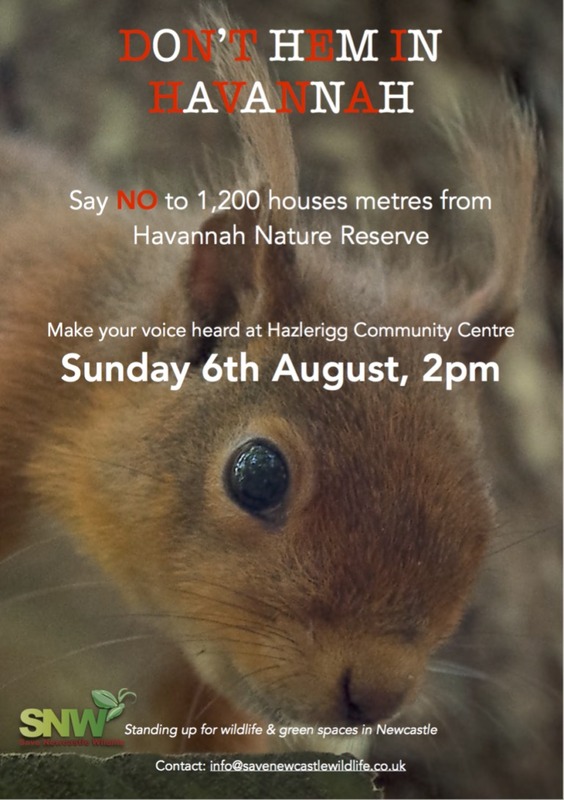 On Sunday, 6th August, at 2pm, we will hold a public demonstration against Newcastle Great Park Consortium’s plans for 1,200 houses and two schools just metres from Havannah and Three Hills Nature Reserve. Come and learn what this development would mean for people and wildlife – particularly the important red squirrel population in the reserve – and how you can make your views known. We will be discussing how we can influence the planning process to potentially reduce the number of houses. We have highlighted a number of technical and legal issues in our objections to the council and the more pressure we can exert, the greater the likelihood we will be able to reduce the number of houses and therefore ensure better protection for wildlife and green spaces. This demonstration is part of our wider campaign to ‘Put Nature on the Map in Newcastle’. Meet at 2pm, in Hazlerigg and District War Memorial Community Centre, just off Coach Lane. The number 44 bus to Dinnington from Newcastle Haymarket stops right outside the community centre.